When we got the invitation to have lunch at Jamie’s Italian, it was an offer we simply couldn’t refuse, to say the least. 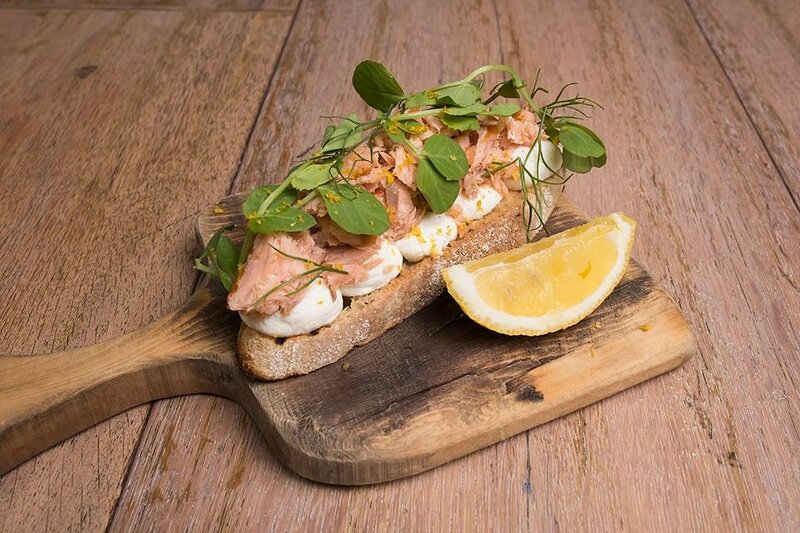 Having opened in Adelaide 4 years ago, Jamie’s Italian has been continuously serving up quality food to customers ever since its inception, and today was no different. It was apparent that every dish we ate had been made with love, and the consistently high-quality food left our cravings happily sated. We sampled a whopping eleven dishes, so I’ll be prompt with this introduction and move onto the good stuff! 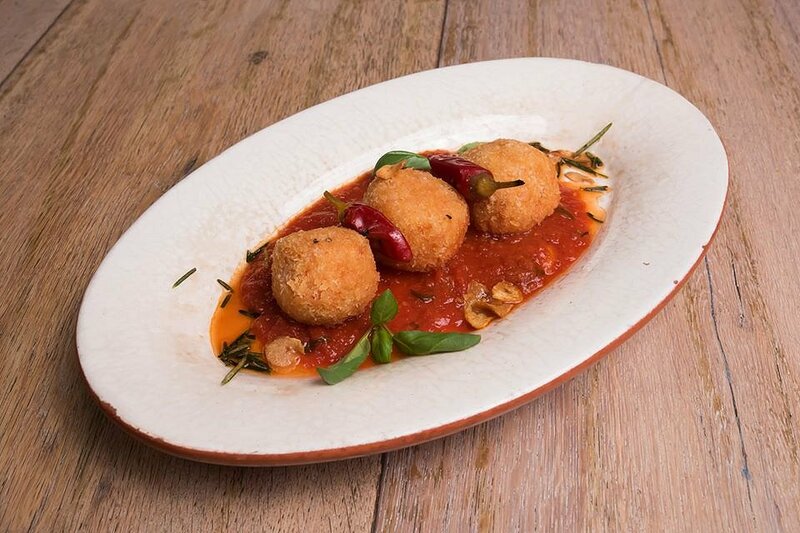 The arancini was simply spectacular; a perfectly fried, golden breadcrumb coating greeted us as we bit into it, followed by the taste of freshly made risotto, all of which was excellently complemented by the tangy garlic basil Napoli sauce. What a great way to start off our lunch! Now, when I read ‘Italian nachos’ on the menu, I wasn’t sure what to expect, so when I saw the deep-fried ravioli being set down onto the table, it was definitely a pleasant surprise. 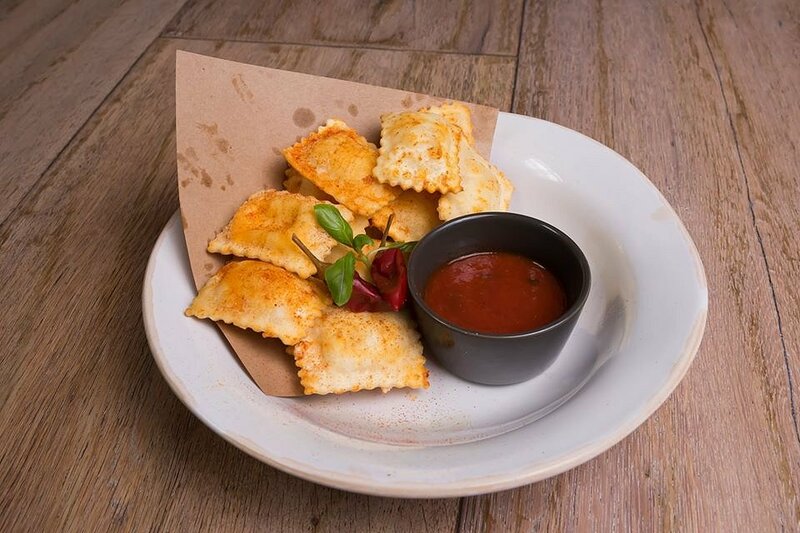 Super crispy pillows of ravioli filled with ricotta and an assortment of other cheeses? Yes please! It could’ve been an excellent dish on its own, but the spicy Sicilian tomato sauce took it to the next level and cemented this dish’s status as one to re-order during my next visit. Layers of well-smoked salmon topped with fennel, lemon zest, and snow pea sprouts, all of which is laid atop a bed of whipped ricotta. Oh, and don’t forget the crunchy, perfectly-toasted bread underneath. 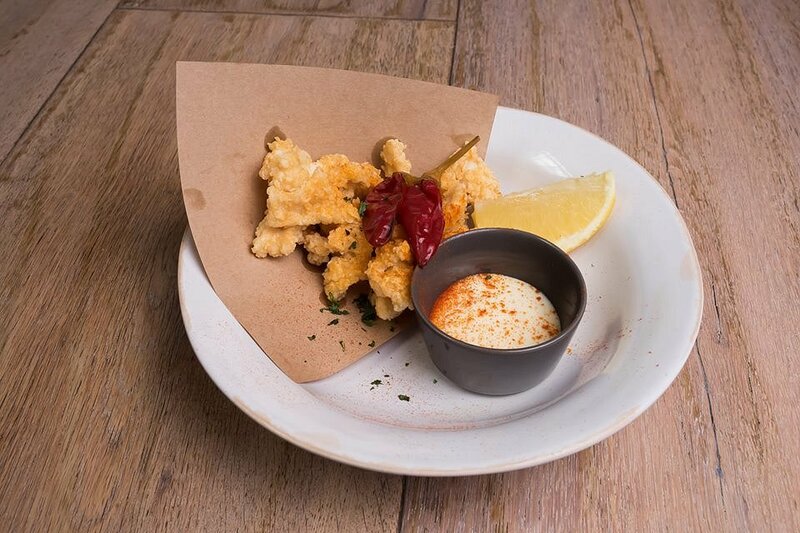 Another very nice starter which was filled to the brim with complementary flavours and textures – what more could you want? I know that squid is the focus of the dish here, but the aioli was seriously amazing; so superbly light, tangy, and creamy that it almost stole the show. Paired with some delicious squid that was incredibly fulfilling and well-fried without being too oily, this dish did everything right. 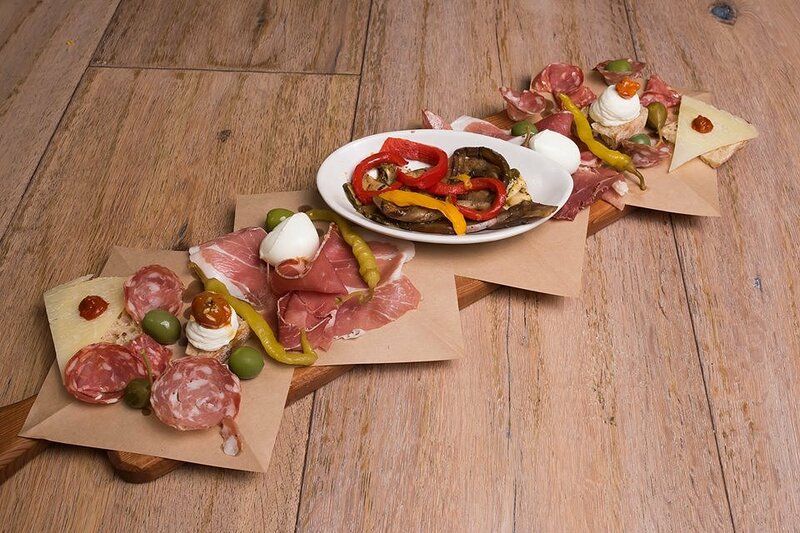 Perhaps the most epic starter we had today; a whole board filled with an excellent variety of meats, accompanied by fresh bocconcini, pecorino, chilli jam, seasonal marinated vegetables, olives, and a small basket of breads. All the cured meats were flavourful, and paired excellently with everything else on the platter. If you love seafood, then this is the dish for you. The taste of crab enriched each bite, making for an incredibly flavourful pasta – it’s obvious that they don’t skimp on the crab meat. 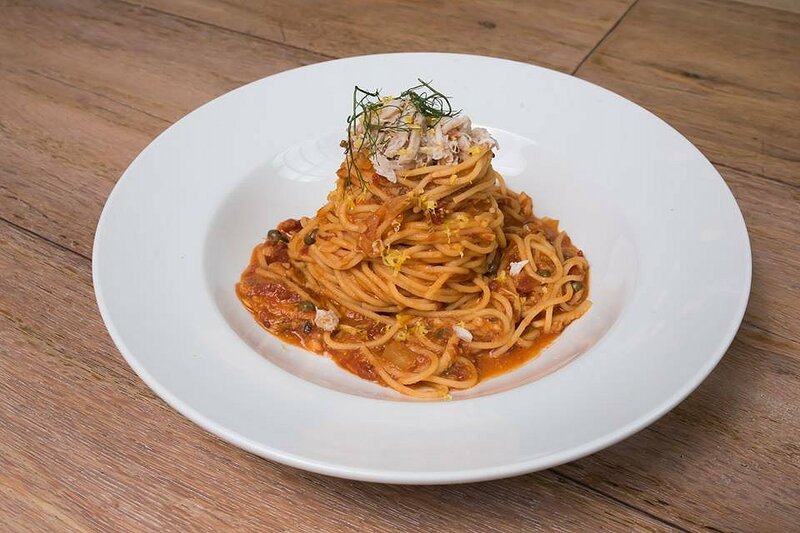 The rich sauce and al dente spaghetti was topped with capers and extra serves of fresh Blue Swimmer crab, transforming this dish from a 10/10 to an 11/10. 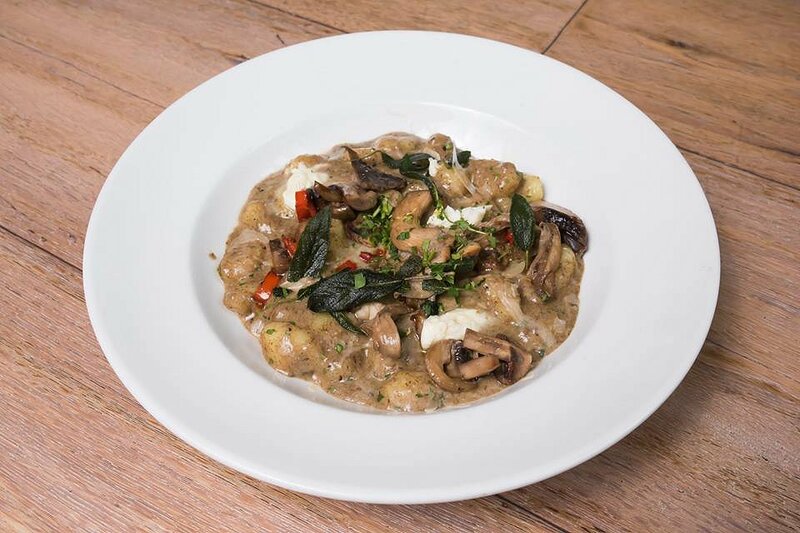 This pasta was my personal favourite of the day; a generous serve of pillowy gnocchi and some super rich and creamy porcini mushroom sauce. 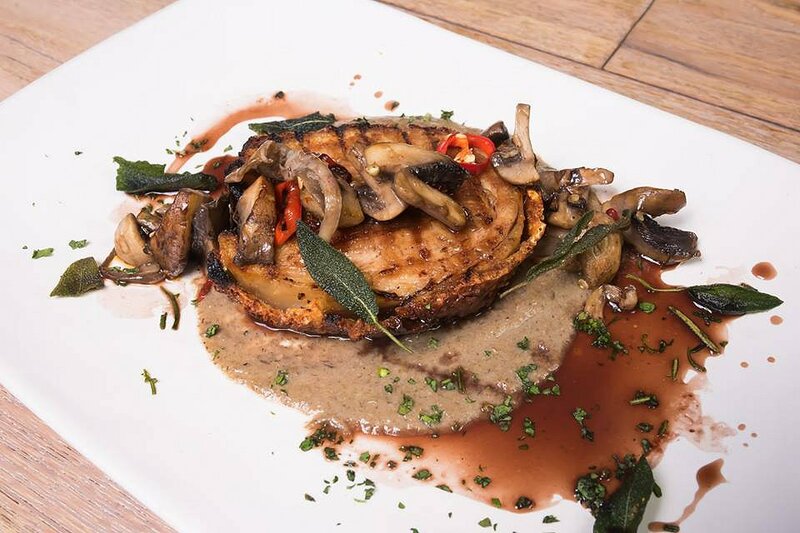 The depth of flavour offered by the nutty porcini mushrooms in combination with the smoked mozzarella and lemony gremolata was out of this world. Topped with some fried basil, this dish tasted like pure decadence. Yet another flawless pasta from Jamie’s Italian which is deserving of a return trip! 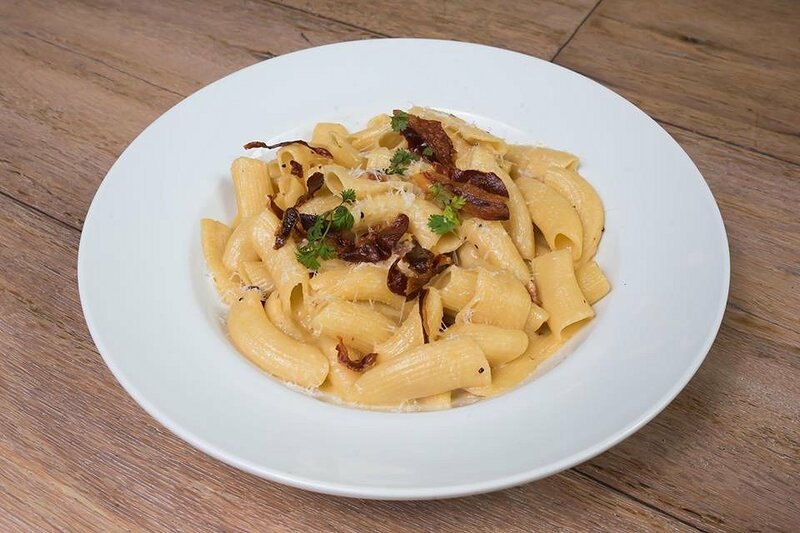 Well-cooked rigatoni, a rich, velvety carbonara sauce, and golden smoky pancetta; together, they make one hell of a dish. The crispy – and when I say crispy, I mean suuuuper crispy – bacon sprinkled on top provided some contrasting flavours and textures, as well as an ultra-satisfying crunch; I could demolish a whole plate of just the bacon bits. You can tell that they took their time cooking this porchetta to perfection; the skin was as golden and crunchy as any good pork crackling, and the meat inside was so perfectly tender that it barely took any effort to slice it up. A generous smear of creamy porcini mushroom sauce, some extra mushrooms on top, and some crispy fried basil were the perfect accompaniments to the pork. All in all, another excellent dish. Feast your eyes on this one; this dish tasted even better than it looked! 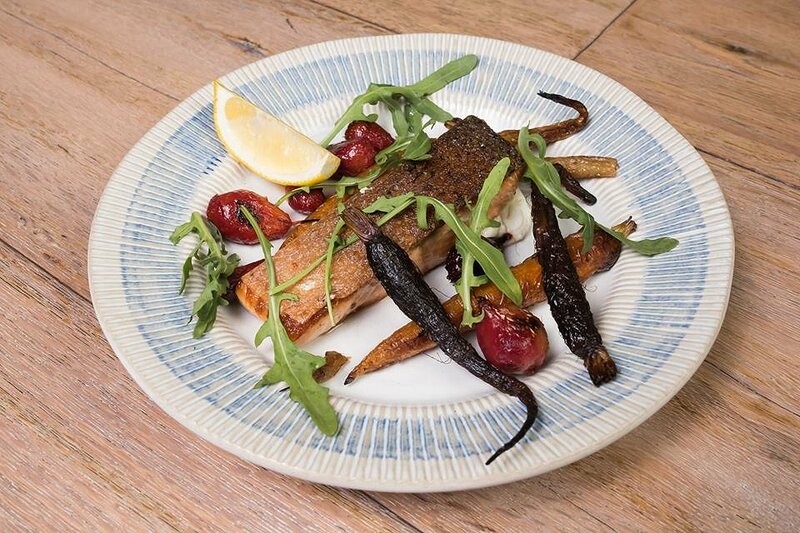 A perfectly-seared slice of salmon with a dollop of whipped ricotta, some roasted balsamic baby carrots and baby beetroots, and a wedge of lemon for added freshness – as you can probably tell, this dish was packed with excellent flavours and textures. The skin on the salmon was wonderfully crisp, contrasting nicely against the tender, flaky meat underneath. The baby carrots and beetroots tasted sweet without being overpowering, and the whipped ricotta was super fluffy – a nice, light addition to the rest of the dish. The flavour of each component was excellent, and it was the perfect simplicity of this dish that impressed us. Speaking of simplicity, this was another dish which succeeded by letting its natural flavours shine through. 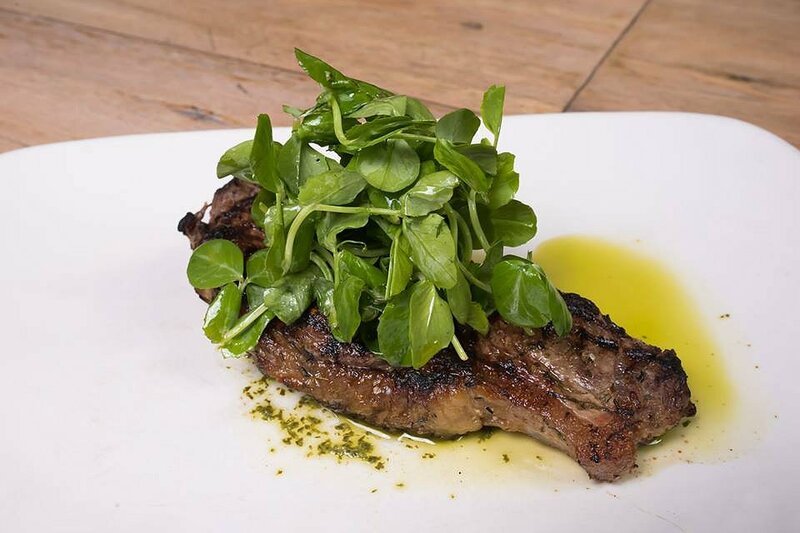 A nice cut of steak which was perfectly cooked and wonderfully tender on the inside, sprinkled with some flavoursome basil oil, and a salad of snow pea sprouts for added freshness. No need to hide behind heavy sauces! The quality of the steak speaks for itself. Our dining experience at Jamie’s Italian was as good as it could be, and I know I’ll be returning soon for more high-quality food. This is the perfect restaurant for all occasions, whether it be a casual lunch or a celebration of some sort, and with their new menu in the works, it’s the perfect excuse to head over and sample their Autumn/Winter menu before it’s gone!